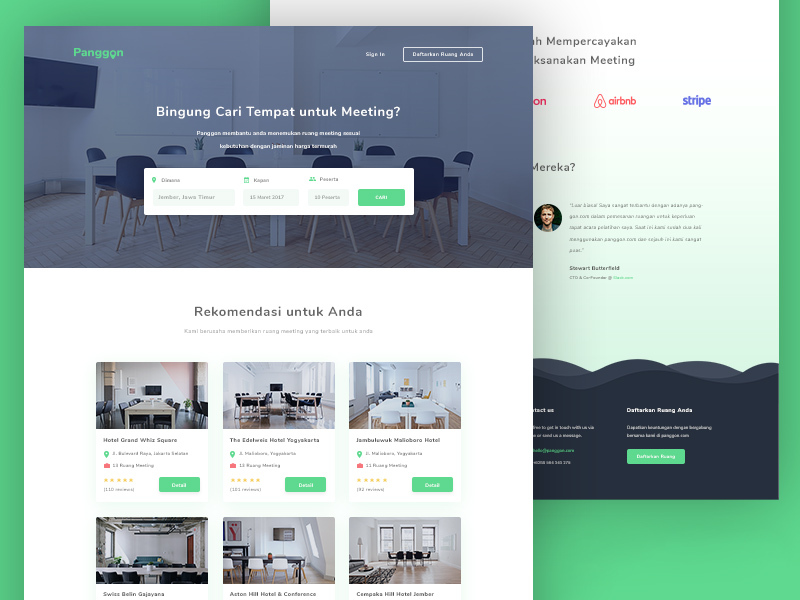 Panggon – Meeting Room Booking Website Template is a free flat psd UI kit.Download PSD WEBSITE TEMPLATES. Todays special is a ui kit PSD free download. Panggon – Meeting Room Booking Website Template is a fresh, clean, active and sweet for maximized editability and ease of use. This PSD WEBSITE TEMPLATES perfect for freebie, landing, landing page, marketplace, psd, room, search, ui, ux, web. The design is very modern and sleek to impress all your visitors easily. Panggon is a modern and elegant meeting room booking website template. Offered as a free PSD, this resource has a clean color scheme and layout that can be easily implemented using Bootstrap. Also the template has all the section this type of website should have, so you can be sure you will have a complete site. The author of this neat design is Ahmad Nur Fawaid.